Nova Racing Stable’s Star Strike, caught the eye with a dashing workout at Selangor Turf club today (Wednesday). Taken out by Jockey S Ruzaini, the seven-year-old by Sakhee’s Secret, did a trot on the first lap and then galloped impressively over 600m and return a very smart time of 35.4 seconds on a tight hold. Tan Soo Beng trained Star Strike has been consistence in his form when finished second to First Precinct in a Class 4 (A) event over 1200m this month. 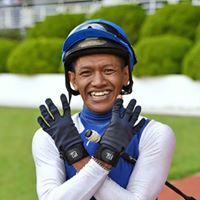 Jockey Ruzaini takes the ride on Star Strike and the pair looks hard to beat in the Class 4- A- event over 1400m in Race 4 on Sunday. RACE 2: Dee Majulah did a canter then sprinted smartly in 35.9 seconds. Just Duit did a trot and then strode out smartly in 39.6 seconds on the bit. RACE 6: JJ Star did a canter then reeled off a good turn of speed in 35.9 seconds. RACE 9: Sangkuriang (Chavez) did a trot and galloped keenly in 35 seconds. RACE 11: Sgfifty (HS Gill) did a trot and a sparkling workout in 37.7 seconds on the bit.